When it comes to describing happy, healthy teeth, showing is always better than telling. So browse through these pictures of our patients to see how Dr. Maggiore and Dr. Boggess, along with their team, have improved their smiles and their oral health. 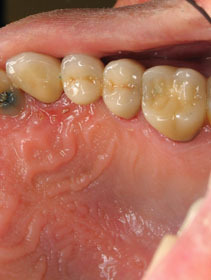 This patients’ gum tissue became hyper-plastic (overgrown) during orthodontic treatment. A single appointment (lasting less than one hour) utilizing a soft tissue laser, has a remarkable effect. 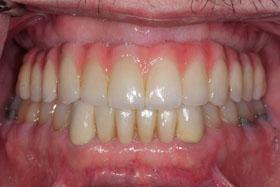 This patients wanted to correct the “gummy” appearance of his smile. 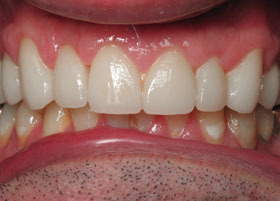 A periodontal procedure known as crown-lengthening allowed us to reposition his tissues, exposing more of this teeth. 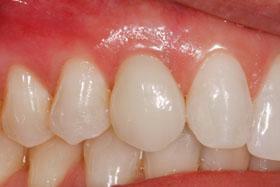 Porcelain veneers were then placed on the upper 4 incisors. 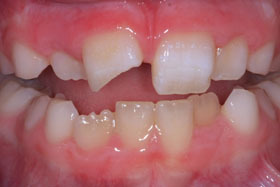 Children’s teeth are often more difficult to repair than an adult’s due to the color, contour and position. 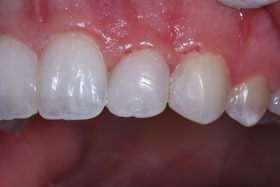 Note the small bumps, called mamelons, along the edge of the incisors. 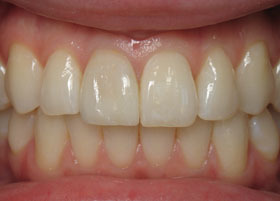 This photo shows the final restoration; the mamelons have been re-created and custom tinted to match the adjacent tooth. 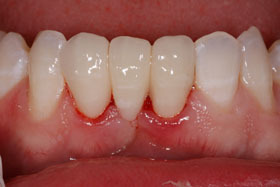 The trauma to this central incisor is an excellent example of custom shade matching. This child’s teeth are actually two colors. 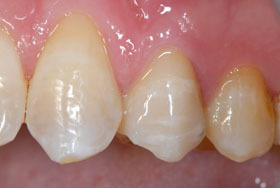 There is an underlying, darker shade, as well as a brushstroke opacity running across the tooth. The final restoration was placed by Dr. Maggiore and custom tinted in less than one hour. 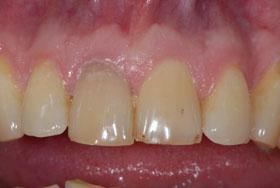 Tooth colored fillings provide a conservative means to make esthetic improvements. 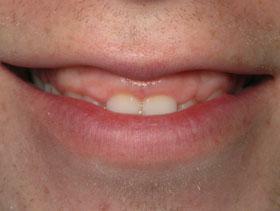 The gap above was closed by directly bonding to the teeth. There was no damage to the teeth and no need for anesthetic. 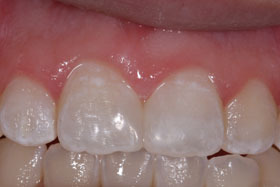 The case above is an extreme example of what can be accomplished with composite fillings. 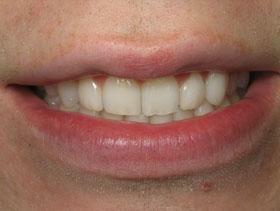 This patient was too young for porcelain veneers and had declined orthodontic treatment. 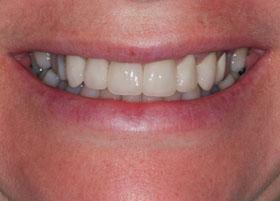 Dr. Maggiore restored the upper front teeth, in a single visit, using only composite. 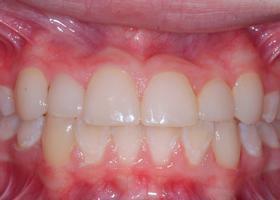 The patient was still a teenager, so Dr. Maggiore placed composite fillings. 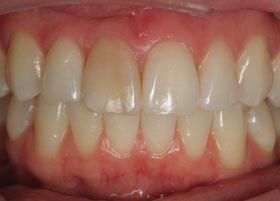 The photo above shows the final restorations a couple months after placement. 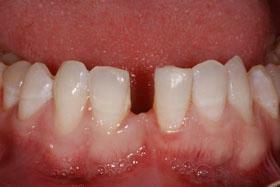 Another example of a diastema closure. 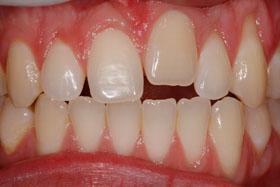 These restorations are placed without any modification to the teeth. Therefore there is no damage to the teeth and no need for local anesthetic. A great use for dental composite is to provide an immediate, temporary, solution to what will likely be a much more involved long-term treatment. At the time of this accident, Dr. Maggiore restored both incisors with composite as an immediate esthetic and protective solution. 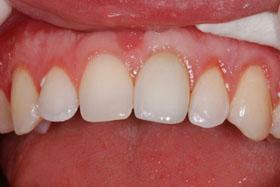 This patient’s lateral incisors are undersized. Rather than close the gaps with braces or porcelain veneers, Dr. Maggiore elected to bond composites directly to the teeth. This provided an affordable esthetic option that could be completed in a single visit. 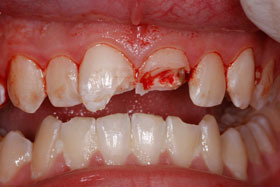 This patient lost an incisor due to trauma. Above is an example of a fixed bridge; three crowns joined together to replace a missing tooth. The photo was taken immediately after the bridge was bonded into place. The inflammation present will be gone within the first 48 hours. 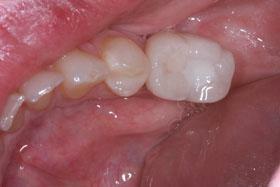 This patient had been missing an upper bicuspid for years. 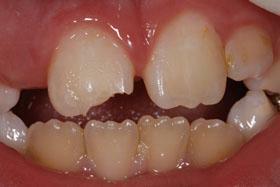 After fracturing the second bicuspid, he elected to replace the missing tooth with a fixed bridge. The photo shows the final bridge two weeks after initial placement. A childhood trauma resulted in this patient’s central incisor fusing to the bone; it cannot be moved. Dr.’s Maggiore and Cross elected to proceed with an immediate implant procedure known as The SMILE Technique. Over the course of a single morning, the tooth is extracted and a dental implant is placed along with a hard and soft tissue graft. 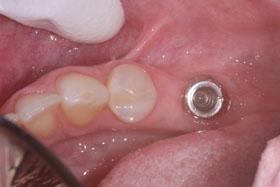 A custom temporary crown is then fabricated and secured directly to the implant. 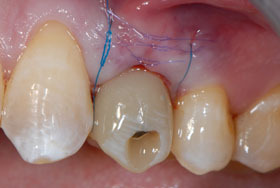 Note that the gum tissue has been repositioned to support a final restoration that is the exact size and contour of the adjacent tooth. 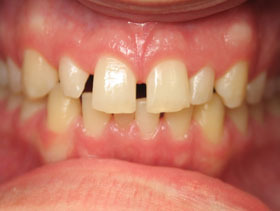 This patient’s upper front teeth had been compromised by gum disease. A weekend fall resulted in the loss of one of the teeth. 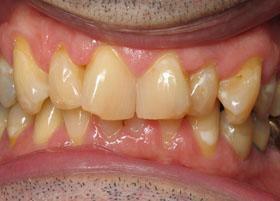 The adjacent teeth were unstable and had a poor prognosis. 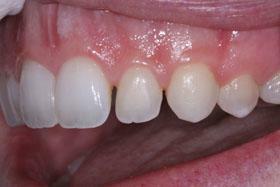 Dr. James Davis extracted the four incisors and placed two dental implants. Dr. Maggiore used the implants to support a fixed bridge. 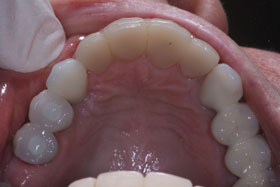 The photo above shows the final bridge which is both a functional and esthetic improvement over the natural teeth. This patient was born without an upper canine. 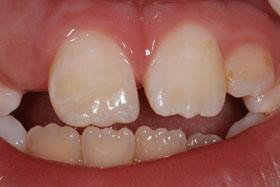 Over time the retained baby tooth became more noticeable due to discoloration and its smaller size. Dr. Maggiore elected to replace the tooth using The SMILE Technique. Working with Dr. David Cross, the baby tooth was extracted, a dental implant placed, and a custom fabricated temporary crown was secured to the implant in a single visit. 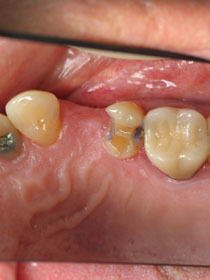 Most important for this patient, she was never without her tooth. She went from her baby tooth, to a fixed temporary crown in a single visit. 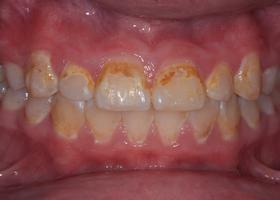 This patient’s teeth were compromised due to gum disease and severe decay. He was told that his only option was dentures. While the upper teeth could not be saved, dentures were not his only option. 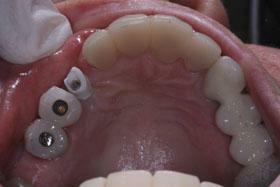 Six dental implants were used to support a fixed porcelain bridge replacing all of the upper teeth. The lower teeth were restored with traditional crowns. 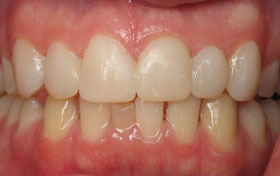 In the past, once the molars were lost, a patient’s only option was a removable partial denture. The patient above, elected to have three dental implants placed. Dr. Maggiore used the implants to support three individual crowns, which are shown in the photo on the right. 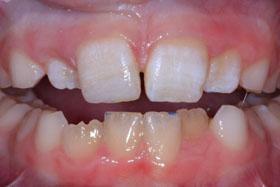 This patient has lost both molars and a pre-molar on the lower right side. Often, with dental implants, it’s not as much what the patient is missing but what they need to function again. 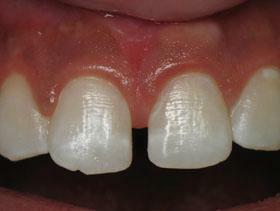 In this case a single, wide platform, implant supporting a molar-sized crown fully restored the patient’s function. This patient’s premolar was lost due to a root fracture. The photo on the left shows the temporary crown in place the day of the surgery. The final step is to seal the access which is still visible. 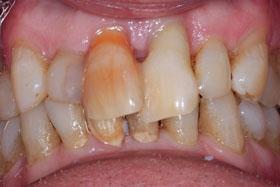 Note that this patient’s teeth exhibit tetracycline stain. 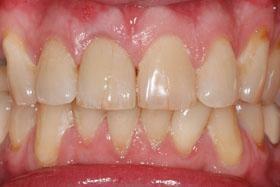 This accounts for the lateral bands of discoloration throughout the teeth. Although it is difficult to replicate, the final crown, pictured above, is a perfect match. 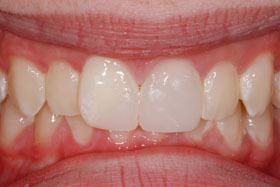 Another dentist had attempted to correct the gaps between this patients teeth by placing crowns on his central incisors. Unfortunately the gaps were too big to be closed with only two crowns. this resulted in the “beaver tooth” appearance. 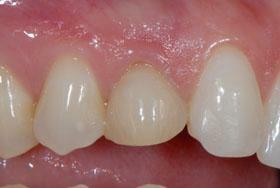 The photo above shows the significant esthetic improvement after placing crowns on all four upper incisors. 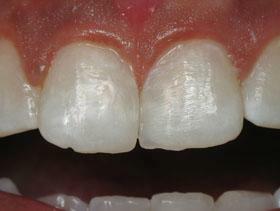 A single central incisor is the most difficult restoration in dentistry. Any discrepancy in size, color or contour will be immediately noticeable. 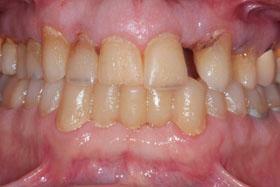 This patient had sustained a trauma that eventually resulted in the discoloration of her incisor. 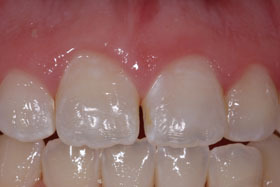 Using digital technology and computer color analysis, Dr. Maggiore was able to create a restoration that is indistinguishable from the adjacent tooth. As we age, our teeth can shift. Fillings and crowns can wear and discolor. The patient above wanted to improve her smile. Dr. Maggiore used a removable orthodontic appliance to align the upper teeth, then placed a combination of porcelain crowns and veneers on the upper front teeth and bicuspids. This patient was born with an enamel defect that resulted in the discoloration on her upper left incisor. Recently, she chipped the adjacent incisor. 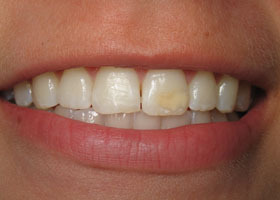 The teeth were whitened using an at-home kit. 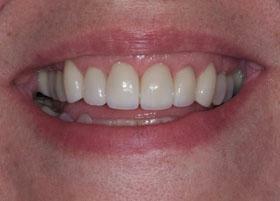 Dr. Maggiore then placed porcelain veneers on both central incisors. 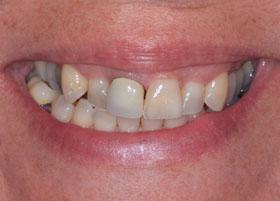 More than a decade ago this patient had composites bonded to her front teeth. Over time, the bondings began to discolor and chip. 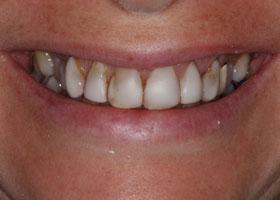 The patient wanted to improve the esthetics of her front teeth, but delay restoring the back teeth. 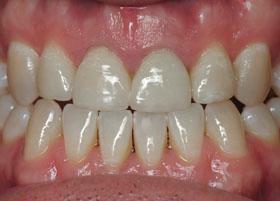 Dr. Maggiore elected to place porcelain crowns on the front teeth. 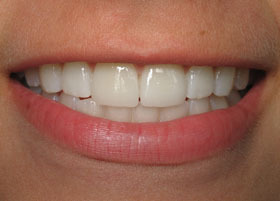 The smile was designed so that additional crowns could be completed in the future in order to further improve the esthetics. 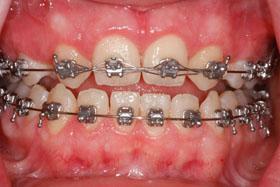 Instant Orthodontics! 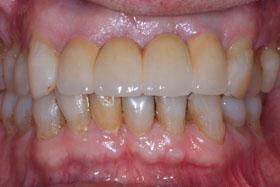 This patient’s teeth were crooked, worn and discolored. 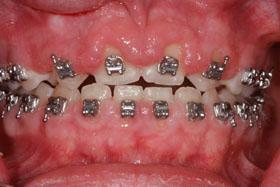 The patient had no interest in braces; he wanted a more immediate esthetic improvement. A thorough clinical evaluation allowed Dr. Maggiore to determine exactly how much tooth structure would need to be removed in order to accomplish this patient’s esthetic goals. 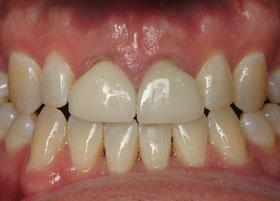 The teeth were whitened and a combination of porcelain crowns and veneers were placed on the upper teeth.